The Best Hospice blogs from thousands of top Hospice blogs in our index using search and social metrics. Data will be refreshed once a week. Also check out Hospice Youtube Channels. 2.52 Hospice Piedmont | Enhancing life at the end of life. Hospice newsletter is a comprehensive summary of the day's most important blog posts and news articles from the best Hospice websites on the web, and delivered to your email inbox each morning. To subscribe, simply provide us with your email address. Fargo, ND About Blog Hospice of the Red River Valley is a not-for-profit hospice that provides intensive comfort care to enhance quality of life for individuals with life-limiting illnesses. Our site shares patient, caregiver and volunteer stories—demonstrating how hospice allows people to live well, and tools and resources about end-of-life and grief. Facebook fans 5,459. Twitter followers 1,793. About Blog A Hospice Volunteer in Urban Nursing Homes, writes this blog. Topics include eldercare, hospice, nursing homes, caregiving, dementia, death, bereavement, and older adults in general. News, practices, research, poems, stories, interviews, and videos are used often. UK About Blog Together for Short Lives is the UK charity for children and young people who are expected to have short lives. Our blog features comment and analysis around the work of Together for Short Lives and the children’s palliative care sector generally. Facebook fans 18,910. Twitter followers 21,679. Missouri, USA About Blog The HEALTHCAREfirst blog offers insights and updates to help home health and hospice agencies stay informed of the latest happenings in our industry. Facebook fans 911. Twitter followers 1,376. Alexandria, VA About Blog The National Hospice and Palliative Care Organization (NHPCO) is the oldest and largest nonprofit membership organization representing hospice and palliative care programs and professionals in the United States. The organization is committed to improving end-of-life care and expanding access to hospice care with the goal of profoundly enhancing quality of life for people dying in America and their loved ones. Facebook fans 41,578. Twitter followers 10,511. Edinburgh About Blog St Columba's Hospice is an independent charity which provides specialist care and support to people from Edinburgh and the Lothians. Facebook fans 5,060. Twitter followers 2,847. Loughborough About Blog Children's Hospice providing specialist respite care, palliative care, and end of life care services to children and young people with life-limiting and life-threatening conditions in the East Midlands, UK. Facebook fans 18,182. Twitter followers 6,824. Facebook fans 753. Twitter followers 1,215. Southeastern Pennsylvania About Blog Age in Place Home Care is a licensed, privately owned, full service provider of non-medical home care registered to provide service in all counties throughout Pennsylvania. Facebook fans 825. Twitter followers 332. Warwick, Coventry and Rugby About Blog At The Myton Hospices we believe that everyone matters for every single moment of their life; we focus on enhancing life when cure is no longer an option. Facebook fans 13,066. Twitter followers 7,250. East Kent, England, UK About Blog Pilgrims Hospices is a charity providing specialist palliative care free of charge to people in east Kent. We care for people with illnesses that can not be cured, including cancer, heart failure, respiratory conditions and neurological diseases. Facebook fans 7,192. Twitter followers 10,771. Santa Barbara, CA About Blog Hospice of Santa Barbara, Inc. is a Volunteer Hospice Organization, which means we volunteer our professional services to anyone experiencing the impact of a life-threatening illness, or grieving the death of a loved one. Facebook fans 1,693. Twitter followers 2,461. Facebook fans 2,176. Twitter followers n/a. San Francisco About Blog Zen Hospice Project is changing the experience of dying through a human- centered model of care. Our mission is to help change the experience of dying. We create space for living that offers the opportunity for individuals, their loved ones and care givers to find comfort, connection, and healing in this shared human experience. Facebook fans 18,878. Twitter followers 7,080. About Blog Harbor Light Hospice promotes dignity and emphasizes quality of life for those who choose to spend end-of-life in familiar surroundings with loved ones. Facebook fans 1,175. Twitter followers n/a. About Blog Founded in 1975 as Hospice of Marin, we provide compassionate hospice care, pediatric & adult palliative care, & grief support for individuals and groups. Facebook fans 699. Twitter followers n/a. Facebook fans 3,851. Twitter followers 789. Danvers, MA About Blog Care Dimensions, founded in 1978 as Hospice of the North Shore, provides compassionate care throughout all stages of advanced illness. Care Dimensions is dedicated to helping patients and families through this difficult and challenging time, so that patients can live each day as fully and comfortably as possible. Facebook fans 3,321. Twitter followers 1,459. Winsford, Cheshire, UK About Blog St Luke's is an integral part of our Cheshire community and since 1988 we have been providing local people with hospice care, offering them the support and help they need when their lives have been turned upside down. Facebook fans 11,443. Twitter followers 4,910. Brighton & Hove About Blog Martlets is a charity that cares for people living through a terminal illness in and around Brighton and Hove. Our aim is to enhance the quality of life and ease the distress of patients suffering from cancer and other serious conditions and for whom curative treatment is no longer appropriate. Facebook fans 5,258. Twitter followers 3,998. Belleville, Illinois About Blog St Leonard's Hospice is an independent charity caring for local people with life-limiting illnesses. The mission of Community Hospice is to provide compassionate, quality care, education and support to terminally ill patients and their families, regardless of ability to pay. Facebook fans 2,929. Twitter followers 332. Denver, CO About Blog For over three decades, more than 60,000 patients and their family members have turned to The Denver Hospice for care and comfort during difficult times. Specializing in personalized hospice care, palliative services and grief support. Our mission is to encircle those facing advanced illness with unprecedented levels of comfort, compassion and expertise. Facebook fans 2,690. Twitter followers 2,042. Rowlett, Tx About Blog Dr. Rebecca Westbrook grew up in middle Tennessee on a small farm. Her parents allowed her to experience the joy of taking care of a variety of animals. Worcestershire About Blog St Richard’s Hospice cares for patients and families in Worcestershire who are living with life-threatening illnesses. Facebook fans 11,997. Twitter followers 6,105. Colorado Springs, CO About Blog Pikes Peak Hospice & Palliative Care has been the community leader in hospice & palliative care for over 35 years. Facebook fans 718. Twitter followers 693. Chichester PO19 8FP About Blog St Wilfrid's Hospice provides end of life care in the community and at our Hospice. We provide essential support for both patients and relatives. Facebook fans 4,520. Twitter followers 2,081. Dayton, OH USA About Blog Hospice of Dayton is a non-profit hospice dedicated to providing the very best end-of-life care, support and comfort for any patient or family that needs it whether at home or our home-like hospice houses and we've been doing it for nearly 40 years. Facebook fans 4,237. Twitter followers 1,547. About Blog St Giles Hospice is a leading charity providing specialist care and support for people with cancer and other serious illnesses across a wide area of the Midlands. Facebook fans 12,441. Twitter followers 4,355. Herefordshire, UK About Blog At St Michael's Hospice, we look after people over the age of 18 with progressive life-limiting illnesses at various stages of their journey. We also provide care and support for patients' families, friends and carers, as well as helping the children of patients with their own needs. Facebook fans 12,804. Twitter followers 6,238. Tulsa, Oklahoma About Blog Oxford HealthCare provides home care and hospice services to people of all ages. The mission of Oxford HealthCare is to set the standard of excellence for home care as we identify and meet the home care needs of people and provide quality care in the comfort of home. Facebook fans 1,489. Twitter followers 31. Jersey, Channel Islands, UK About Blog Jersey Hospice Care (JHC) is a specialist palliative nursing service which provides holistic care free of charge, for patients with life-limited conditions. Facebook fans 7,719. Twitter followers 3,625. Greensboro, NC About Blog Hospice and Palliative Care of Greensboro enhances quality of life by providing expert interdisciplinary care, consultation, support and education for those affected by serious illness, death or grief. Facebook fans 2,762. Twitter followers 2,106. North Charleston, SC About Blog Agapé Hospice provides compassionate care in an embracive and faith-based manner. We are founded on providing the most service and comfort possible to residents and their families, as this is an important time in each of their lives. Facebook fans 3,209. Twitter followers 10. Lexington, VA About Blog Rockbridge Area Hospice treats, comforts and provides supportive care to terminally ill patients and their families in Lexington, Buena Vista, and Rockbridge County, Virginia and has been doing so since 1984. This blog is a one stop location to helpful resources for community members, hospice patients and family members or caregivers. Facebook fans 967. Twitter followers 192. South Lanarkshire About Blog Kilbryde Hospice is a charity which provides care and support to people in and around South Lanarkshire with life limiting illness and their carers. Facebook fans 3,828. Twitter followers 2,213. Nottingham About Blog Nottinghamshire Hospice is a charity providing end of life care and emotional support for adults in Nottingham and Nottinghamshire. Facebook fans n/a. Twitter followers 3,823. About Blog The mission of Hospice & Community Care is to give hope, comfort, and compassion to our community when needed most. Our vision for the future is to remain the area’s first and best choice in the services that we provide. Facebook fans 1,117. Twitter followers 164. About Blog Weston Hospicecare is a registered charity providing specialist care and support to patients with life-limiting illnesses in North Somerset and Somerset. Facebook fans 3,432. Twitter followers 1,599. About Blog Dr. Kim Simpson graduated Texas A&M in 1996 with a doctorate in veterinary medicine. Here you will find latest news and updates of our services from pet care, pet loss to pet euthanasia. Keep yourself up to date with pet news. About Blog Home Hospice Association engages communities to help people die in a non-institutionalized environment. Dignity, care, and culturally sensitive human connection are the hallmarks of what Home Hospice Association brings to the community. Facebook fans 364. Twitter followers n/a. Savannah, GA About Blog Hospice Savannah, Inc., a not for profit organization, provides our community the best services and resources on living with a life limiting illness, dying, death, grief and loss. Facebook fans 1,615. Twitter followers 1,598. SOMERSET, NJ About Blog The Mission of The Oscar and Ella Wilf Campus for Senior Living has always been to be central New Jersey’s leader in providing a continuum of care and related personal services, primarily for the Jewish elderly, in an environment that enhances and respects Jewish values, traditions and lifestyles. Facebook fans 796. Twitter followers 487. Facebook fans 104. Twitter followers 5. Carlsbad, CA About Blog Hospice of the North Coast's Pacifica House is North County San Diego's first free-standing hospice general inpatient facility. Our goal is to maintain dignity, comfort and the highest quality of life for those we serve regardless of age, race, disability, creed, sexual orientation or ability to pay. Facebook fans 899. Twitter followers 1,090. Wrexham, North Wales About Blog Nightingale House is an adult hospice in Wrexham providing specialist care to patients & families living with life limiting illness. Facebook fans n/a. Twitter followers 3,759. Facebook fans 278. Twitter followers n/a. Changsha, China About Blog At Butterfly Children’s Hospices we provide loving care and treatment for children with life-limiting conditions and life-threatening illnesses. We have a children’s hospice in Changsha, and have supported other projects with specialist nursing care and advice for children who have palliative care needs, including those with complex illnesses and at end of life. Facebook fans 3,759. Twitter followers 592. Brattleboro, VT About Blog Brattleboro Area Hospice provides non-medical help to the terminally ill and their families, bereavement support, and education on the issues of loss & death. Facebook fans 615. Twitter followers n/a. Greater Houston, Texas About Blog Founded in 1980, Houston Hospice has evolved from an alternative grass roots concept to a leader in hospice care for people of all ages and all walks of life. Facebook fans 1,264. Twitter followers 1,734. Halifax, Nova Scotia About Blog Hospice Halifax is dedicated to supporting people affected by life-limiting illness, death, grief or loss. We are a non-sectarian, registered not-for-profit charitable organization. Facebook fans 791. Twitter followers 257. About Blog Established in March 1975 as Van Wert Area Visiting Nurses Association, Community Health Professionals (CHP) has grown to become a progressive and diverse organization that provides a comprehensive array of services. Facebook fans 1,605. Twitter followers n/a. 52. Hospice Piedmont | Enhancing life at the end of life. Greenwood, SC About Blog HospiceCare of the Piedmont has remained focused and mission driven. The mission has always been paramount: to deliver the best quality of end of life care and to support families of the dying. In addition, the organization has remained focused on our community. Facebook fans 1,119. Twitter followers 213. About Blog Autumn Care & Crossings is a veterinary house call practice focused on hospice and palliative care for aging or ailing pets. Facebook fans 210. Twitter followers n/a. Chester, England About Blog The Hospice of the Good Shepherd is a respected provider of palliative care for residents of Cheshire West and Chester and Deeside. We provide services free of charge to patients and families facing life limiting illnesses. We provide an in-patient unit, out-patient services, a day therapy centre and offer complimentary therapies and bereavement support throughout the community. Facebook fans n/a. Twitter followers 2,250. Harrogate, North Yorkshire About Blog The Saint Michael‘s blog is collection of news and views on subjects that are important to the communities we serve and to us. Our news team do their best to bring you the latest updates from Saint Michael‘s as soon as they happen, which we hope you will find interesting, informative and thought provoking. Facebook fans 2,234. Twitter followers 3,076. Huddersfield, West Yorkshire About Blog Kirkwood Hospice provides specialist care, free of charge, to adults in Kirklees with advanced, progressive illnesses at any time from diagnosis to the end of life, respecting their individual needs and wishes. Facebook fans 5,380. Twitter followers 8,800. About Blog A Blog for Home Health and Hospice Providers. The McKesson Homecare Talk Blog is an informational resource for Home Health and Hospice providers of all sizes. Industry professionals share their views on the most relevant Home Health, Hospice, Telehealth and regulatory news items that impact your organization. Springdale, Arkansas About Blog Circle of Life provides professional, end-of-life treatment that is customized to the individual patient. We bring hospice care to you wherever you live in Northwest Arkansas --whether it is in your home, a nursing home or assisted living facility. Facebook fans 2,665. Twitter followers 208. About Blog At Abode Hospice & Home Health, our primary ambition is to bring first‑class care to the warmest, most serene environment possible. We provide the full spectrum of hospice and home health care services, thoughtfully tailored to patients and families, with focused attention given to individual needs and preferences. Facebook fans 48. Twitter followers n/a. Scunthorpe About Blog Lindsey Lodge Hospice provide first-class specialist care to those in North Lincolnshire with any progressive life-limiting illness. Facebook fans 3,528. Twitter followers 1,705. About Blog The Hospice Law Blog is designed to provide timely news, insights, legal analysis and resources on Hospice reimbursement issues. The blog’s primary editor, Brian Daucher, has counseled clients on all aspects of hospice law, including hospice cap appeals, selection of cap calculation method, pre-payment edits, and post payment ZPIC audit appeals. Facebook fans n/a. Twitter followers 2,872. Hillington, Norfolk About Blog The Norfolk Hospice provides care and support for people with life-limiting conditions including cancer and neurological diseases. Our Mission is to provide high quality holistic care for adults with life-shortening illnesses, enabling them to live life as well as possible for as long as possible. Facebook fans 1,818. Twitter followers 1,871. About Blog The mission of BSA Hospice of the Southwest is to make a positive difference in the lives of our patients, their families and our community by providing quality Hospice Care with Compassion and Experience. Facebook fans 1,407. Twitter followers n/a. About Blog Hospice of Waterloo Region is a charitable organization whose specially trained volunteers help people affected by life threatening illness, prepare for and cope with death by providing compassionate presence, practical support and education. Facebook fans 533. Twitter followers 1,201. Nashville, TN About Blog TAG Partners creates custom healthcare communications tools for your home health, hospice or private duty home care. Home Care Blog is the place to go for timely tips, news and information to keep your physician and patient marketing efforts fresh and relevant. Facebook fans 20. Twitter followers 832. About Blog Hospice of Siouxland began serving patients and families in 1981. Mission is to provide high quality and compassionate service to relieve suffering and improve quality of life for individuals and their families facing advanced illness, end of life and grief. Facebook fans 768. Twitter followers n/a. About Blog Seasons Hospice is a community-based organization with a mission to find creative solutions that add quality to end-of-life care. Founded in 1997, Seasons Hospice & Palliative Care is the fifth largest Hospice provider in the nation. Facebook fans 724. Twitter followers 59. Allegan, Michigan About Blog Wings of Hope Hospice helps patients enjoy their last days, weeks or months in the embrace of loved ones and comfort of home. We help dying patients and their loved ones through the dying process. In Wings of Hope Hospice care blog you will find helpful information related to hospice care, grief support and advanced illness management. Facebook fans 637. Twitter followers 80. Charlevoix, MI About Blog Hospice of Northwest Michigan provides comprehensive physical, emotional and spiritual care to individuals and their families during and following life-limiting illness. Facebook fans 626. Twitter followers 117. About Blog Hospice is a team of specially trained professionals who act as a bridge to care and resources on a person’s end-of-life journey. Research shows that individuals who choose hospice actually live longer than those who don’t. Facebook fans 608. Twitter followers n/a. About Blog At Hearts for Hospice & Home Health, our primary ambition is to bring first‑class care to the warmest, most serene environment possible. Facebook fans 516. Twitter followers n/a. Norman, OK About Blog A Note from the Founders... When my wife, Ashley, and I decided to permanently transition from pastoring churches to full time hospice work, we were determined to create a hospice that cares about people more than profits. Hospice care is our specialty, and we guarantee that the people that we serve will have access to the absolute best that hospice has to offer. Facebook fans 323. Twitter followers 29. Mesa, AZ About Blog Reflections Hospice provides comprehensive hospice care to individuals and their families. The mission of Reflections Hospice is to provide comprehensive coordinated care to individuals with life-limiting illnesses and to their families and to support them in the process of death and bereavement. Facebook fans 251. Twitter followers 34. About Blog Hospice is designed to provide comfort and support to patients, so they may live out the last phase of their lives with dignity in a familiar setting. The goal of hospice care is to improve the quality of a patient’s last months by offering comfort, dignity and care in a familiar setting, whether that be in the patient’s own home, assisted living, or skilled nursing facility. Facebook fans 217. Twitter followers n/a. About Blog Divine Hospice and Palliative Care allows patients who are terminally ill a way to improve their current state of life. Facebook fans 173. Twitter followers n/a. New York, USA About Blog 1-800-HOSPICE is the Nation's Leading Hospice Network. Our mission is to promote hospice awareness and education. Hospice is about life, and we believe strongly in the need to bring this subject to the forefront of the national dialogue to eliminate the stigma surrounding this most noble of disciplines. Our mission is also to connect patients with providers. Facebook fans n/a. Twitter followers 99. About Blog Rest Assured Hospice is a nonprofit organization dedicated to providing superior hospice services to those with life limiting illnesses. Facebook fans 41. Twitter followers 13. Houston, TX About Blog Lisa has served as a trusted advisor to the hospice industry for over 10 years. As an executive leader for most of her career, she has a broad knowledge of hospice business operations. She has been responsible for all aspects of program leadership and development, from smaller free-standing agencies to programs with integrated service delivery systems. About Blog Good Samaritan Hospice is a locally owned and operated by hospice experienced RN. Patient care is our number one priority at Good Samaritan Hospice. Big company experience with the hometown heart, serving all of north Alabama. This blog is dedicated to providing informative topics to help anyone dealing with death. Moreno Valley, CA About Blog Destiny Hospice & Palliative Care will become the extended family of patients and caregivers. You will never feel alone when our compassionate staff has you in his or her hands. By giving care, faith, and hope, your quality time with loved ones will be more fulfilling. We will work closely with your family to follow all of your “end of life wishes” and lessen your physical and emotional suffering. About Blog Adaptive Nursing and Health care opened in Jeffersonville, Indiana in 2012 and rapidly became a trusted and qualified homecare provider in Southern Indiana. Our goal for homecare is the same for hospice care: to keep individual s at home and safe for as long as they want to remain there. About Blog A blog about volunteering in hospice care. I have been volunteering in a residential care hospice for more than fifteen years. The work centres my life, reminding me of the things that really matter in life. Being able to be of service to people who are dying and to their families provides enormous meaning for me. 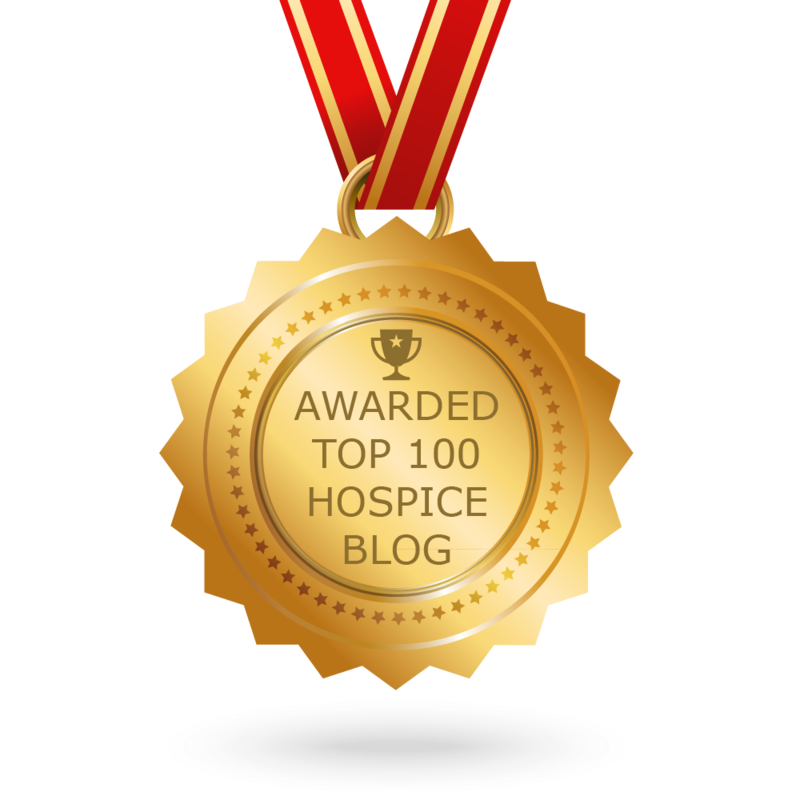 CONGRATULATIONS to every blogger that has made this Top Hospice Blogs list! This is the most comprehensive list of best Hospice blogs on the internet and I’m honoured to have you as part of this! I personally give you a high-five and want to thank you for your contribution to this world.